The Democratic Party (DP) has resolved to throw its weight behind Makindye East MP Michael Mabikke, the Inter-Party Cooperation flag-bearer in the city mayoral race.According to the party Chairman Baswale Kezaala, the DP National Executive Committee which convened on Wednesday at the party headquarters preferred Mabikke against Kampala Central MP Erias Lukwago. “We looked at Mr Mabikke from the IPC perspective and since Mr Lukwago ignored room to amend his relationship with the party, we preferred the former,” Mr Kezaala told journalists in Kampala yesterday. “Like we said earlier, we can cooperate with IPC at lower levels of leadership and this process has started,” he added. 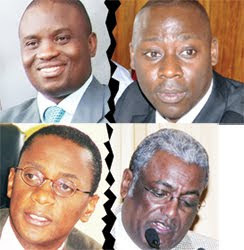 The two MPs face NRM’s Peter Sematimba and Capt. Francis Babu who defied his party and get nominated as Independent. “He [Lukwago] has not been supportive of the party in any way, and we gave him enough chances but he misused them,” Mr Kezaala added. Sources that attended the NEC meeting told Daily Monitor that Mr Mabikke, also president of the Social Democratic Party (SDP), will in-turn back a DP candidate Sebastian Lwanga for the Makindye East parliamentary seat. Mr Lukwago, a former DP legal adviser, fell out with his party recently to join the Suubi 2011 pressure group which fights for the interests of Buganda Kingdom.This group, which comprises mainly of Buganda-leaning politicians, has since signed a memorandum of understanding with the IPC to create a joint campaign platform. Early this week, IPC electoral commission chairman Rubaramira Ruranga said they have not held any discussion with Mr Lukwago over his intended mayoral candidature and advised him to step-down in favour of Mr Mabikke. He said Mr Mabikke was their preferred candidate as far as the IPC protocol is concerned. This view, however, is at odds with the IPC/Suubi wing of the alliance which is standing with Mr Lukwago who was nominated as an independent candidate.DP had chosen former NSSF Corporation Secretary John Baptist Kakooza as its flag-bearer but reversed the decision for what it said were the wider interests of the opposition. This seems to have set a new battle within opposition ranks since none of the two rival candidates is willing to step aside. Mr Mabikke, who also walked out of DP to form SDP, said the latter’s support was a manifestation that “my candidature has brought support across the political, religion and tribal divide.” “This is indeed a golden opportunity I must utilise so that I don’t disappoint the people,” he said. After his nomination last week, Mr Mabikke held his first rally at Katwe, Makindye Division while Mr Lukwago held his first rally at Nakasero Market, Central Division.Kampala District has five political divisions which have exhibited unique voting patterns basing on their social, religious and economic factors. Kampala Central is highly commercial and a cosmopolitan division while Rubaga is more of a residential area mainly inhabited by old Buganda and conservative Catholic families that have generally thrown their lot with politicians from the DP. Kawempe on the other hand is Muslim dominated and densely populated while Nakawa is a cosmopolitan but dominated by northerners and easterners.